At least 10 major categories of abortion restrictions are premised on assertions not supported by rigorous scientific evidence, according to a new analysis in the Guttmacher Policy Review. These restrictions include unnecessary regulations on abortion facilities and providers, counseling and waiting period requirements rooted in misinformation, and laws based on false assertions about when fetuses can feel pain. 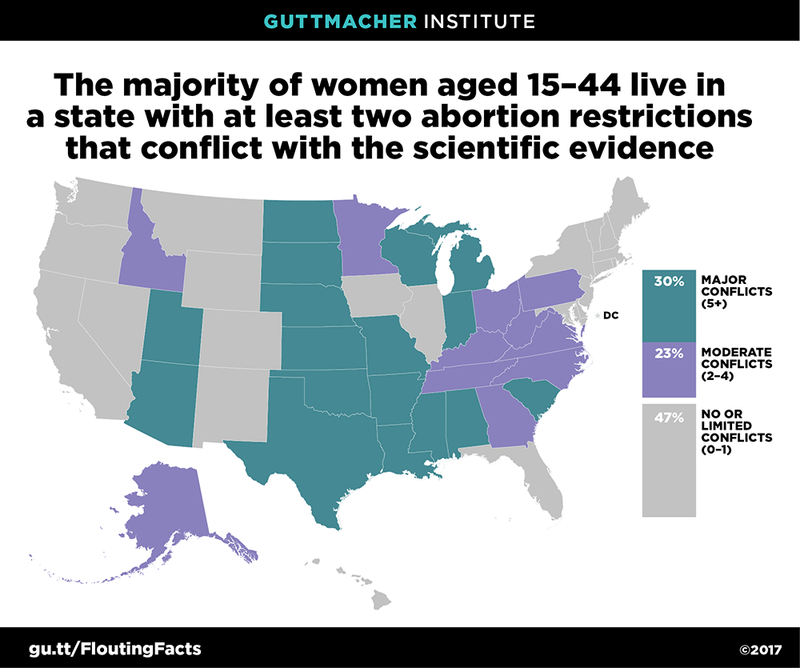 The authors, Guttmacher Institute experts Rachel Benson Gold and Elizabeth Nash, document that over half of U.S. women of reproductive age live in states where abortion restrictions are in effect that have either moderate or major conflicts with the science. The worst offenders are Kansas and Texas (with laws in effect in eight out of the 10 categories) and Louisiana, Oklahoma and South Dakota (seven such laws each). A table with information for all states is included in the full analysis. Restrictions targeting abortion providers: Some states have mandated specific standards for abortion providers that do little or nothing to improve safety, but significantly limit access to abortion. This includes imposing excessive physical plant requirements, requiring providers to have unnecessary admitting privileges at local hospitals, banning the use of telemedicine for medication abortion and limiting the provision of abortion to physicians. Counseling and waiting period requirements: Some states require that providers give women information on the consequences of abortion that is contradicted by the scientific evidence, including misinformation around mental health, future fertility and breast cancer. Some states also impose mandatory waiting periods based on the faulty premise that women need additional time to consider their decision. Restrictions using fetal pain as a pretext: Several states have used unproven assertions that a fetus can feel pain at 20 weeks postfertilization (which is 22 weeks after the woman’s last menstrual period) as a basis for either banning abortion after that point in pregnancy or informing women that an abortion could cause pain to the fetus. The authors find that nearly one-third (30%) of all U.S. women of reproductive age live in one of the 17 states with at least five of the 10 types of restrictions. Another 23% of reproductive-age women live in states with 2–4 restrictions. Combined, just over half (53%) live in a state with moderate or major conflicts with scientific evidence. Conversely, just under half (47%) of all U.S. women of reproductive age live in the 22 states that have none or only one of these restrictions.